Excellent! trains today’s students in the hospitality industry with the language competences they will need for a successful future career. Catering, cooking, bar and service are all covered in this course which ensures thorough revision of grammar and extension of trade-specific vocabulary in clearly labelled, dedicated sections. Excellent! concludes with a useful photo-glossary of foodstuffs, drinks, bartending tools, dinner service and weights, measurements and temperature conversion charts. 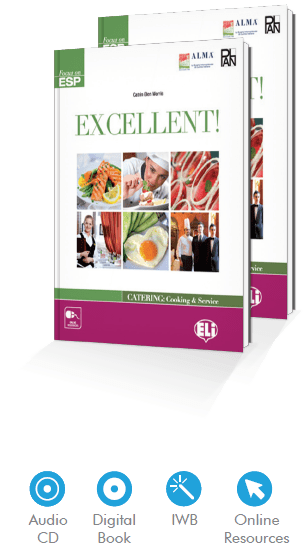 8 Modules covering hospitality, catering, restaurant staff, kitchen and equipment, food and cooking methods, food conservation, menus, food safety, drinks and serving techniques. Variety of text types from descriptive texts to authentic and adapted articles, from recipes to interviews. Careful grading of topics, grammar and vocabulary: A Taste of Language. Thorough development of the 4 language skills. 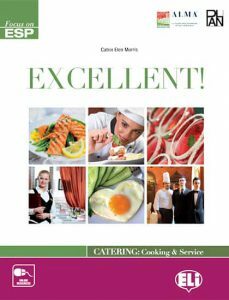 Extensive use of photographs to ensure understanding of the more technical aspects of English for catering. Preparation for Cambridge Preliminary (PET) and First (FCE) examinations. 5 Dossiers present aspects of English-speaking countries linked to aspects of the hospitality industry. Geography, culinary habits, society, food blogs and government institutions.